You may need to uninstall and reinstall those plugins if you installed them before you had a Beta on that machine.I did, I do not run Beta's but I needed the TDLmake fix in this one. The Full version on my PC has a bad TDLmake issue. Thank you for the info. Any other files besides those I need to do? I did, I do not run Beta's but I needed the TDLmake fix in this one. The Full version on my PC has a bad TDLmake issue. Thank you for the info. Any other files besides those I need to do? Any plugins that don't have a separate package for the Beta. Okay got it, Thank you again. 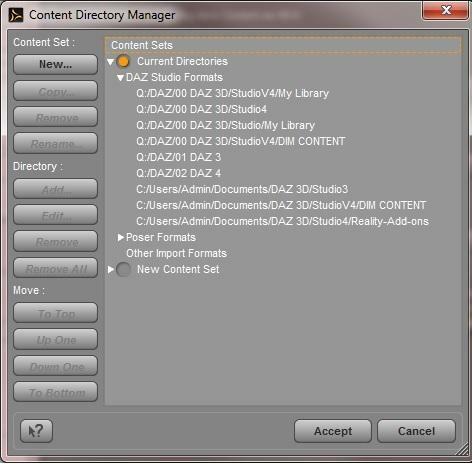 I have a problem accessing content I previously created in DAZ Studio Pro - version 4.6.2.120 64 in Pro Beta 4.6.3.29 64. I exported user data from 4.6.2.120 and then imported user metadata into 4.6.3.29. I noticed that the re-import metadata progress bar stayed on 0% the whole time but after several minutes the import completed and I was able to see my content library categories and their off-the-shelf contents. But the stuff I created just shows exclamation marks. The path is correct except for the <base_folder>/ element. Any ideas about fixing this? Did you add your Content folders in Content Directory Manager? The Beta does not share settings with the general release. Hi fixmypcmike, thanks for the fast reply! I added the top level directories where I keep my content to the Content Directory Manager. 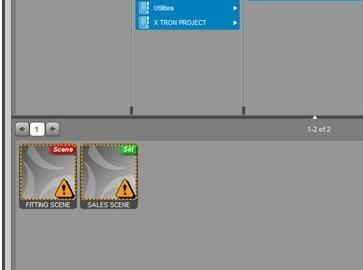 In this case my SALES SCENE.duf file is in a sub-directory of a sub-drectory under Q:/DAZ/01 DAZ3. Do I need the full paths to all the content directories? Now, Is there anything most users need to do regarding the new PG DB administratively with the PGadmin tools, or can we just let it do its job in the background without interrupting the creative flow, as it should, IMO. Also, where can we find some docs/tutorials on using the new Geometry Editor and other new features? The intention of the CMS is to have you do as little as possible and just let it do its job. You should not need to do anything with it with any PG admin tools and any maintenance you may need to do, like add your own categories, or make Smart content work more is a way that works for your workflow, can all be handled from within DAZ Studio. Anyone knows where is the button/menu line to save as a figure (not wardrobe). I´ve been searching every single panel and bar and I haven´t found it.